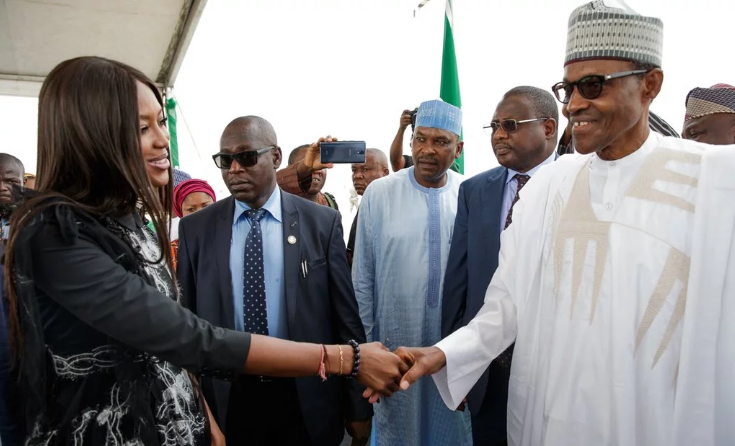 The picture of President Muhammadu Buhari with Super Model, Naomi Campbell has stirred up controversies. This was after the model shared a tweet alongside several photos with Buhari at the launch of the Eko Atlantic City . However, the presidency in a swift response, through the Personal Assistant to Buhari on New Media, Bashir Ahmaad, insisted that Campbell “bumped” into her principal and requested to take pictures. However, Nigerians have faulted the pictures as they wondered why President Buhari shook hands with the model but refused to do same with female ministers. @hgclothing “Buhari shook Naomi Campbell’s hand. Lol.. religious laws are for the poor and downtrodden. @Oniggors “But I thought our President don’t shake hands with females,how come he shook Naomi Campbell??? @Dondekojo “So, Nigerian women are the only ones he can’t shake then, and what’s Naomi Campbell’s role again? Do we have dirty diamonds in Eko Atlantic? @steph_alova “What baffles me is how they both coincidentally met there and she was allowed to come into touching distance of Mr. President. Was the venue not combed by security? If she wasn’t invited, then all in charge of President’s security av questions to answer. @Mrwizzo “How long will this Govt continue to lie and live in lies… na wa oh! @Drolufunmilayo “So Naomi Campbell was just strolling on the street looking for where to buy recharge card, and Buhari just met her? @Chingyarmani “So Naomi Campbell just suddenly became a guest? and Protocols couldn’t stop her from standing near the President? @Even a Local Government Chairman would have been bundled away if he came uninvited. @Uche_Ezeonye “Naomi Campbell confirms that she was actually invited by President Buhari after The President’s Aides denied knowledge of the Model’s visit to Nigeria. 0 Response to "Nigerians React To Buhari’s Handshake With Naomi Campbell"